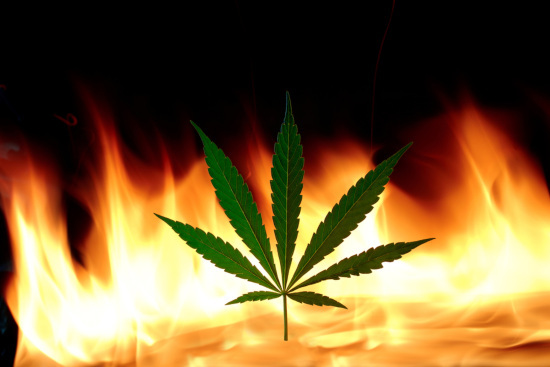 Given the nature of cannabis, it’s probably not a great idea to make it fire-resistant! And tragically, marijuana crops have literally gone “up in flames” before they have even reached retail shops and dispensaries. On July 23, 2018, five marijuana greenhouses at Loudpack Farms in Greenfield, California were obliterated by fire. While no employees were injured in the blaze, it resulted in millions of dollars in damages and raises many concerns regarding cannabis and fire protection. Fire really is no “match” for concrete! Pun intended! Concrete may not be known as the most aesthetically pleasing building material. And people seem to have no trouble littering it with gum and tobacco products. But concrete is actually an extremely practical and versatile building material! Concrete is made of limestone, clay, gypsum, and other aggregate materials, all of which are virtually non-combustible. Concrete’s slow rate of heat transfer makes it an even more dynamic fire shield. Concrete walls can withstand up to four hours of extreme fire pressure, while most wood walls are obliterated by fire in less than an hour. Concrete also has the advantage of emitting no toxic materials, smoke, or molten particles in the presence of fire. The fire performance of concrete is superior to that of other materials and it has the highest fire resistance classification (class AI) under EN 13501-1:2007-A1:2009. The presence of concrete in International Vault’s various expertly designed vaults makes them ideal for the protection of cannabis. International Vault harnesses the inherently fire-resistant power of concrete to construct vaults that help to ensure the safety and integrity of the booming marijuana industry. The CUNA Mutual Standards explicitly state how fire resistance in concrete wall thickness is determined. A Class B 2-hour fire-resistant reinforced concrete wall can be no less than 6 inches thick. The minimum thickness of a 4-hour fire-resistant vault wall is 8 inches (203 mm) for reinforced concrete. The minimum thickness for a 6-hour fire-resistant vault wall is 10 inches (254 mm) for reinforced concrete. International Vault’s MegaCrete concrete panels have an even greater PSI (concrete compressive strength) than those set forth in the CUNA Mutual Standards! And even our LightWeight Modular panels yielded exceptional results! Our vault doors, in addition to our wall panels, are filled with concrete. To provide the fire resistance for cannabis and other valuable assets, International Vault now offers an Insulated Vault Door, aka a fire door with a 4 hour rating! Rated to protect vital records, including those stored on paper, magnetic media, and microfilm.